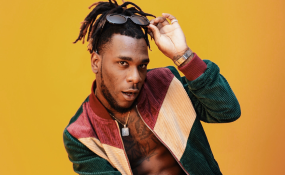 Nigerian Afro-fusion star, Damini Ogulu aka Burna Boy has debuted on the UK music chart with his feature in 'Location'. 'Location' is a song off the debut album of UK based rapper Dave titled 'Psychodrama' which entered as Number one in this week's Official Albums Chart. The ranking separates them into the 'Official Singles Chart' and the 'Official Albums Chart'. Three songs off 'Psychodrama' claimed the three highest new entries on the 'Official Singles Chart'. These include the J Hus-assisted 'Disaster' at Number 8, 'Streatham' at Number 9, and the Burna Boy-assisted track, 'Location' at Number 11. NAN reports that the 'On the Low' singer began the musical year with hefty, fan-favorite tunes including 'Dangote' and 'Killin Dem' featuring Zlatan.